All these points are backed by mainstream research – read more in our Briefing Sheets section. – and the many, many comments it generated. Establishment (BRE) for DEFRA – the most comprehensive study of recent years. been off-set by the huge growth in aircraft numbers – causing more noise in total. than a gleam in the researcher’s eye. 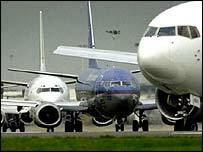 Air pollution is a major issue for those who live in the vicinity of large airports. in 1999 with an update in 2006.
and being zero-rated for VAT – worth at least £9 billion a year. and the environment, which are estimated to be around £16 billion a year. 325 million in 2015, 480 million in 2030 and around 580 million in 2050. Explanation and comment to understand the forecasts is available on the AEF website. being questioned. The Observer article discusses the problems. The Observer – Carbon offsetting Ripoff? very ineffective as a meals of reducing the climate changing effect of emissions. planes, blaming cows, flying in straight lines, to keeping the planes clean. likely to be the ones who live under flight paths and near the busy feeder roads. because ‘everyone else does’, or because we’re unaware of alternatives. fly the least. There is a real question of justice here.